Heat your home with energy absorbed from the air around you. An air source heat pump extracts heat from the outside air in the same way that a fridge extracts heat from its inside. It can get heat from the air even when the temperature is as low as -15&deg; C. Heat pumps have some impact on the environment as they need electricity to run, but the heat they extract from the ground, air, or water is constantly being renewed naturally. can be easier to install than a ground source heat pump, though efficiencies may be lower. Heat from the air is absorbed at low temperature into a fluid. This fluid then passes through a compressor where its temperature is increased, and transfers its higher temperature heat to the heating and hot water circuits of the house. Installing a typical system costs around £7,000 to £14,000. Running costs will vary depending on a number of factors – including the size of your home, and how well insulated it is, and what room temperatures you are aiming to achieve. it meets additional criteria if in a conservation area, World Heritage Site or similar. This list is not comprehensive, contact your local planning office for full details. Do you have somewhere to put it? You&apos;ll need a place outside your home where a unit can be fitted to a wall or placed on the ground. It will need plenty of space around it to get a good flow of air. Is your home well insulated? Since air source heat pumps work best when producing heat at a lower temperature than traditional boilers, it’s essential that your home is insulated and draught-proofed well for the heating system to be effective. What type of heating system will you use? Air source heat pumps can perform better with underfloor heating systems or warm air heating than with radiator-based systems because of the lower water temperatures required. 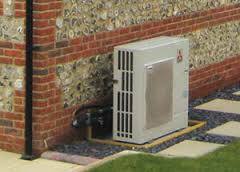 You may also want to consider ground source heat pumps, which use pipes buried in the garden to extract heat from the ground.